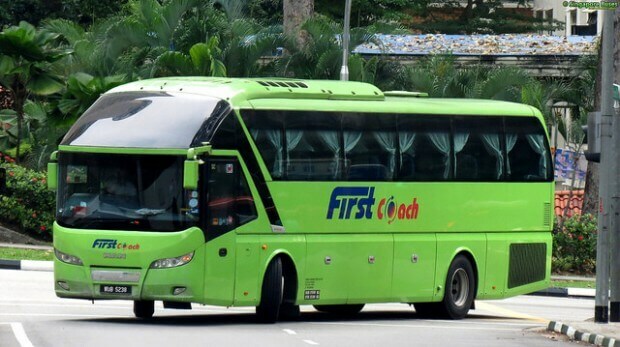 First Coach burst into the industry with a new age of luxury executive express coaches, cruising across highways from Singapore to Kuala Lumpur and back, with 6-8 daily trips. First Coach delivers comfort and convenience without the expense of safety, ranking them amongst the most reliable operators around. Their fully air-conditioned coaches are equipped with ergonomic reclining seats, each with spacious legroom. Videos On Demand (VOD) are also provided featuring music and movies, projected on individual screens of each seat, ultimately, equating to an opulent travel experience. Their coach captains are experienced and well trained with good communication skills. CatchThatBus offers online bus tickets to many routes covered by First Coach as well as seat availability features. You can book your bus ticket online from our website or via mobile app which can be downloaded for free on Google Play or App Store.